Ask for "Un Pont®" : it's Pontarlier-Anis ! Call for the Eagle on the label of this near century old aperitif. Invented by Georges GUY in 1921 with the help of his father Armand, the Pontarlier-Anis is made using the family recipe for Absinthe de Pontarlier with the omission of the Absinthe plant ! This product is exclusively obtained by distillation of the green anis grain and various carefully selected plants and herbs. Green Anis grain, essential ingredient in Absinthe. 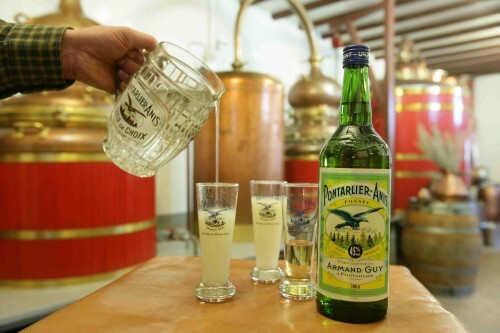 And so was born the first anis drink of Pontarlier, when it was again authorized in France to distill anis. It was illegal to distill any anis based products before 1921 since the 1915 ban of Absinthe which contained a high level of anis. This aperitif will surprise you with its exceptional lightness. The subtle flavor is due to the distillation of green anis in 100 years old casks, infusing a delicate taste to Pontarlier Anis unknown in other anis based aperitifs. Pontarlier Anis has obtained many gold medals in exhibitions at the Salon de l’agriculture in Paris (5th Gold Medal in 2014). Vintage 15 bottles wooden crate. Pontarlier-Anis at the start had a feminine gender due to its closeness in taste with Absinthe but has now a masculine gender. Badiane refers to Star Anis. The minimum dose of sugar brings a roundness and smoothness to the taste on the palate. It is the trademark of the House. With a drier taste approach the Pontarlier-Anis à l'ancienne brings a refreshing drink. Originally created to comply with the rules concerning the alcoholic content of Anise based drinks, the Pont 40° is enjoyed with a 4 cl dose. With a lower Aniseed content than the Pontarlier-Anis 45°, the taste and aroma gives a refined and subtle finish. Also worth trying is the Liqueur of Anis: Anisette Franc-Comtoise ! 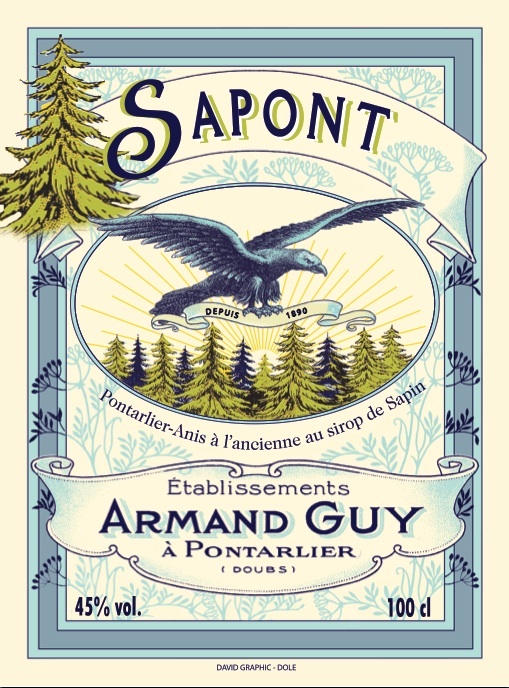 The distillery has just released a Sapont ready to drink, with syrup, liquor and infusion of fir buds in the famous anis based product. This new drink will give your taste buds a treat with a subtle mixture of anise and fir buds. We wish to inform our customers that for 2015, the alcohol tax tariffs, social security and VAT represent 65% of the product’s sales price. They continue to increase annually every January by a law change. To sample with fresh water and you will discover its unmatched taste. Pontarlier-Anis is traditionally served with ice-cold water which releases the natural aromas of the Anise plant. 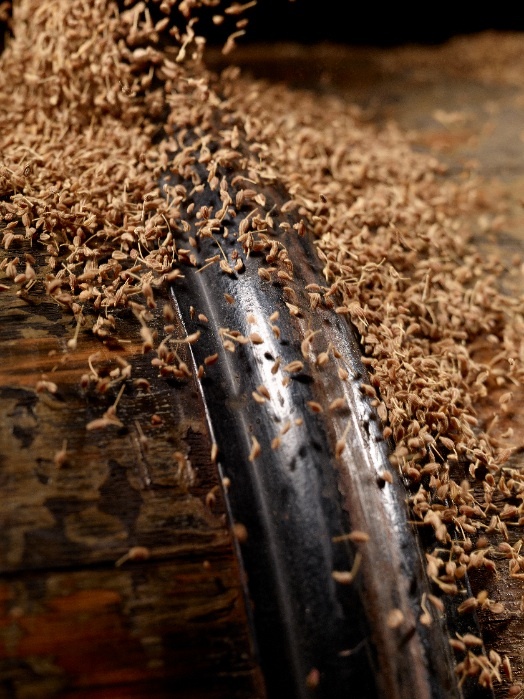 To release the taste and aromas of the Anise it is best to use the least tasty water possible to avoid tainting the original taste. When in contact with water, the Pontarlier-Anis will become cloudy. Keeping Pontarlier-Anis in the refrigerator will not affect the taste in anyway, but dont be surprised if the Anis itself appears cloudy. A few minutes before serving leave the bottle in room temperature water to restore its clarity. Adding ice to the water before serving can have similar effects. For information about their uses in the kitchen or for cocktails, you can go to our section “Guy r’mandises” (The GUY Delicacies) only on the French version. For other associated products such as glasses, pitchers and trays: click HERE. To find the distributers the closest to you, please contact us. To access the Photo gallery, click on any of the thumbnails.